Why don't we see more of hexachrome to this day? Actually, there were systems that used Green and Orange in the past, but they were used to expand the range of the basic CMYK print, but these days the pigments are so good that hexachrome system was closed. I was a student when hexachrome came around and I've discussed it in class before now that I teach but, to be honest, I haven't really seen it in use (other than a magazine I had that introduced the idea of hexachrome). I've had this discussion with colleagues before and no one really knows what happened to this technology. How have the pigments changed? I'm sort of having problems understanding which properties of a pigment can improve to the extent that the extra inks could simply not be used (green, orange, and I believe violet was sometimes also included). Hexachrome was discontinued by Pantone in 2008 when Adobe Systems stopped supporting the HexWare plugin software. I know this is an old post, but it deserves some more info. The reason Hexichrome was discontinued is multi-part, but all rooted to profit. It really didn't die. It just changed form. Hexichrome was first used primarily for fine art prints. (I think it was originally a proprietary technology, not Pantone technology.) Then someone realized that the extended gamut let them quite accurately reproduce a huge chunk of the Pantone spot library. Imagine what that does for ink sales. Hexichrome was heavily licensed to head off abuse. That makes the market very narrow for Adobe who then decides it isn't profitable to support the plugins. Hexichrome dies. Almost. Pantone sells Hexichrome to HP/Indigo. Hexichrome becomes Indichrome. Indichrome adds Violet to the mix and can hit 90% of the Pantone library and gives Indigo a strong advantage over other digital machines. Eventually it is reborn as Pantone XG, adding the V from Indichrome. XG is used for flat builds of Pantone colors for brand identity. XG is heavily used in package printing. By using the 5th unit for O, G, or V and coordinating color runs, a printer can reduce countless color changeovers to just three. 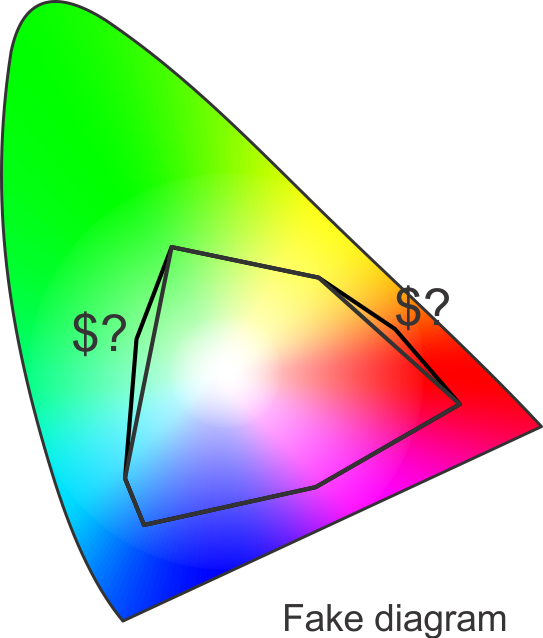 I am not aware of anyone using it for extended gamut within color images yet because of lack of application support. If that has changed, I would love to hear about it. What happened is really easy to imply. No profit. If it had no profit it is also easy to know why. Not enough people were using it. And if not enough people were using it is also easy. It did not offer enough advantages over other systems. Let's say each printing machine costs 100,000 dollars per printing head. One machine of 4 heads would cost 400,000 dollars. One of 6 heads 600,000. This is 150% the cost of one 4 heads. Yes, of course, the technology is there. There are several 6 head printing machines. But people started to use the extra heads to print some other spot inks. A metallic one, the company logo color, or adapted one head to add a varnish. If you had a 4 head machine, you would need to clean the machine, add 2 more new inks, align the project again, print 2 new colors. This would take all day, and it is really, really more profitable to keep printing in "just" CMYK, Eight different projects on one day than only one. If you have a smaller machine, let's say 2 heads you have a similar issue. Now I am going to be really unprofessional assuming things. What could change in an ink? 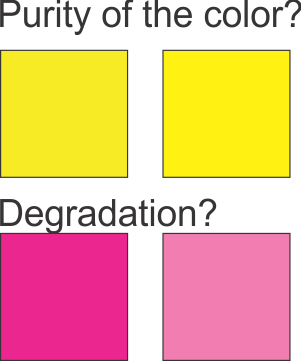 The purity of the color, the resilience to degradation, the toxicity, new synthetic composition, cost? But the real question is, does this "increased gamut, justify the increased cost? This fake diagram represents the theoretical augment in the gamut provided by an Hexachrome system. Does it worth paying 50% of the cost, plus the extra time to print it? Not the answer you're looking for? Browse other questions tagged print-production color-reproduction or ask your own question. Why aren't there printers that use red-green-blue ink cartridges? Why can't you get one-off stickers/vinyls printed? How do I ensure that my greys don't have a colour sheen when printed from Photoshop? What's more expensive: hot foil or blind emboss? Why can't laser printers always reproduce small isolated dots? Why color printout looks different from display? Why the color is falling off from a Bristol cardboard laser printed?